Some time ago, the Varnish Cache project released a new upstream version 6.0 of Varnish Cache. I updated the fedora rawhide package a few weeks ago. I have also built a copr repo with varnish packages for el6 and el7 based on the fedora package. A selection of matching vmods is also included. Please test and report bugs. If there is enough interest, I may consider pushing these to fedora as well. 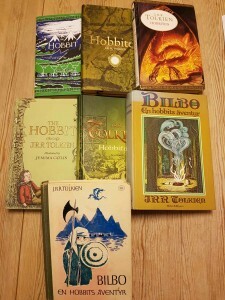 I read Tolkien’s “canon”, that is, The Hobbit, The Lord of the Rings, and The Silmarillion, around Christmas every year. So also this year. One of the most fascinating stories in The Silmarillion is of course the story of Túrin Turambar. He is regarded as one of the major heroes of his age. At the Council of Elrond, Elrond himself lists the great men and elf-friends of old, Hador and Húrin and Túrin and Beren. But while reading through the Silmarillion, there are few among mortal men that have also added so much pain and disaster to the elves. While a great war hero, Húrin was also responsible for the slaying of the greatest hunter of the elves, Beleg Cúthalion, the strong bow. Being the war hero, he turned the people of Nargothrond away from the wisdom of their history, and even their king, and made the hidden kingdom available for the enemy. How many elves were cruelly slain or taken to captivity in Angband because of Turin’s pride? Thousands! Perhaps even tens of thousands? So how come the elves, ages later, still reckoned Túrin son of Húrin as one of the great elf-friends? In a Nordic saga style stunt, Túrin finally slew his greatest enemy, Glaurung the great fire-breathing dragon. Glaurung had been a continous danger to all peoples of Middle-Earth, and the end of that worm was of course a great relief to all the elves, even Elrond’s ancestors, the kings of Doriath and Gondolin. Also, we must remember that the lives of the elves are different from that of men. When the elves’ bodies die, their spirits go to Mandos, where they sit in the shadow of their thought, and from where they may even return, like Glorfindel of both Gondolin and Rivendell. But when men die, they go to somewhere else, and are not bound to the world. It seems that elves are more willing to forgive and let grief rest for wisdom over time, than are men’s wont. Even the Noldor who survived the passing of the Helcaraxë forgave and united the Noldor of Fëanor’s people that left them at the burning of the ships at Losgar. Perhaps that is one of the lessons learned from the tragic story of Túrin. From all his unhappy life, good things happened, and afterwards, the elves forgave and even mourned him and his family. 2017 was a great year for Tolkien fans. 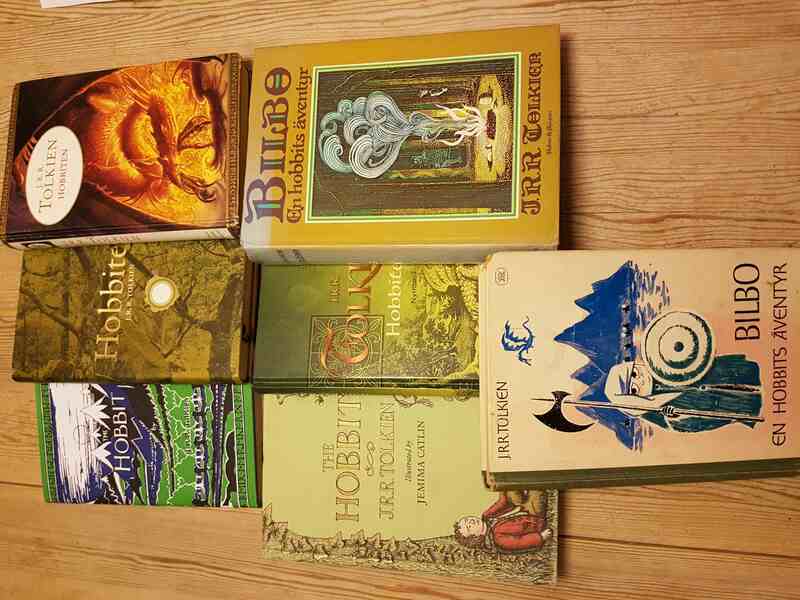 It was the 125th anniversary of the Professor’s birth, and the 80th anniversary for the Hobbit. We also got the magnificent news that Amazon will produce a TV series based on “previously unexplored stories based on J.R.R. Tolkien’s original writings“. So what storylines would that be? A reboot of the 2001-03 trilogy is out of the question, as Peter Jackson explored and extended more than enough already. So, what do we have left? A lot! Let’s have a look. The Lord of the Rings and its appendices tells stories in several different timelines. Long before (as in hundreds, and even thousands of years) before the main story, just before the main story (like a few decennials), parallel to the main story, and after. One storyline could follow the ancient history of Gondor and Arnor. There are lots and lots of substories there. If I should pick one I would like to see, it would be the stories of the kings Arvedui of Arnor and Eärnil II of Gondor, perhaps started with the Firiel incident. There are lots of exciting points to pick up there. Gondor throne heiritage politics, the war against, and the prediction of the downfall of the Witch King, the flight to Forochel, with the disastrous ship’s wreck in the ice, and the loss of the palantiri. For the “near history” before The War of the Ring, the obvious choice would be a “The young Aragorn” series, where we could follow Aragorn in his many guises, riding with the Rohirrim, going on raids with Gondor against Harad, in and in constant conflict with Denethor. And his love life, of course, with his meeting and very long-term relationship with Arwen. And speaking of Arwen, her family story is a good storyline, with the love of Celebrían and Elrond, travelling from Lorien to Rivendell, and her abduction, and Elladan and Elrohir’s rescue of her from the orcs. Parallel to that, the story I would most love to see, would be, the story of Denethor. His tragic life is worth a season alone. Another storyline from the years just before The War of the Ring, could be Balin’s attempt to retake Moria, and build a colony of dwarves. Lots of gore and killing of goblins to depict! Parallel to the War of the Ring, there are a lot of things going on, that are merely mentioned in the book, and completely forgotten in the movies. The fight in Dale. The Ents’ war against the orcs after the capture of Isengard, the loss of Osgiliath and Cair Andros, to name just a few. And of course, even after the the War of the Ring, and the Return of the King, there are stories to follow up. Aragorn’s “negotiations” for peace with his neighbouring peoples, with armed battle as alternative, supported by Eomer of Rohan. The sweet but bitter death of Aragorn and Arwen. The reign of King Eldarion. I’m optimistic! This is going to be great! I read Tolkien’s “Canon”, that is, The Hobbit, The Lord of the Rings, and The Silmarillion, every year about Christmas. These year, it’s even The Hobbit’s 80th Anniversary, and to celebrate, I have of course read through The Hobbit again. So many have said so much about this book, so I’d rather show off my newest addition to my Tolkien bookshelf. 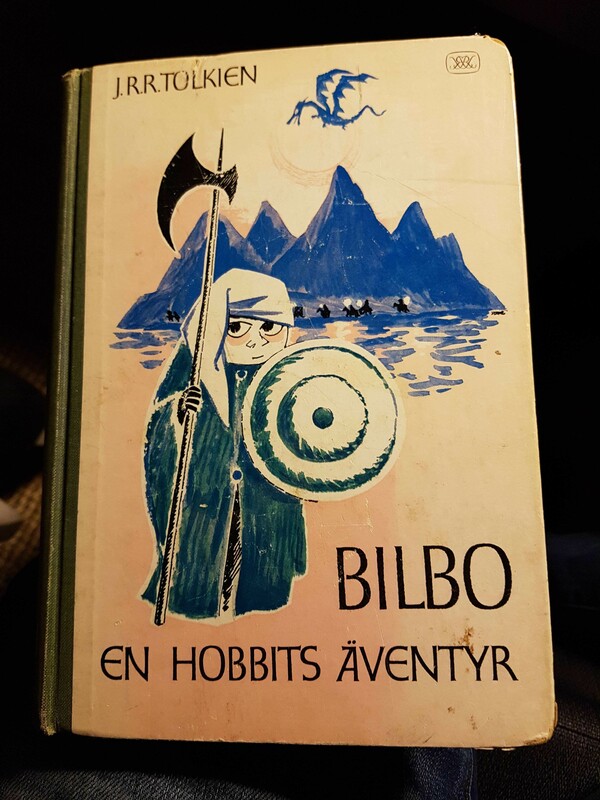 This is the Swedish 1962 edition of The Hobbit, Bilbo, En Hobbits Äventyr (Bilbo, A Hobbit’s Adventure), and it has quite an interesting history. In the 50s and 60s, Astrid Lindgren, maybe most famous for her children’s books about Pippi Longstocking, worked as an editor at the department for Children’s literature at Rabén & Sjögren, who published Tolkien’s works in Sweden. Lindgren was very interested in Tolkien’s work, and while she later denied Tolkien as an inspiration for it, she published the quite Lord of the Rings reminiscing Mio my Son in 1954, and later the world beloved classic children’s fantasy novels The Brothers Lionheart and Ronia, the Robber’s daughter. 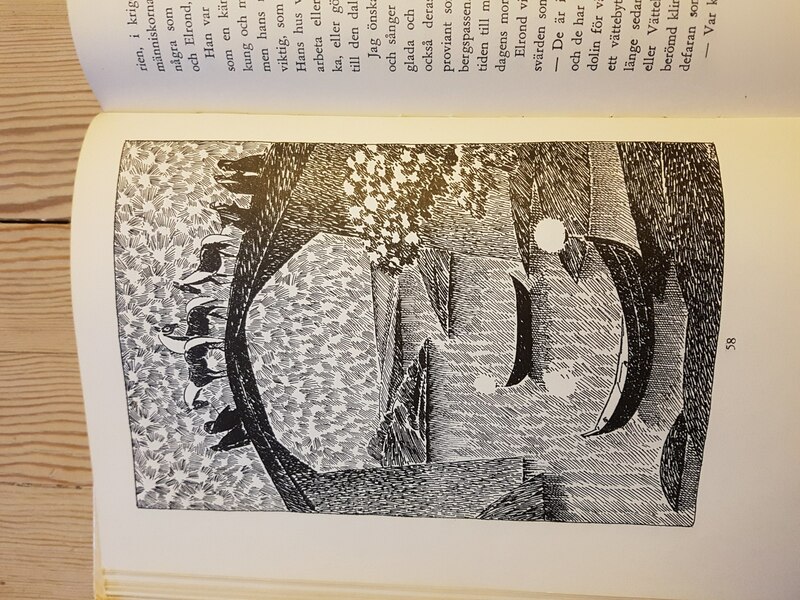 In the early 60s Lindgren was not content* with the current Swedish translation of The Hobbit, Hompen (translation by Tore Zetterholm, 1947), and wanted to better it. So she opted for a new translation and got hold of Britt G. Hallqvist for the job. For illustrations, she contacted her friend Tove Jansson, now World famous for her Moomin Valley universe. 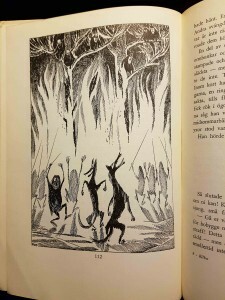 Jansson had already had success with her Moomintrolls, and had previously made illustrations for a Swedish edition of Lewis Carrol’s classic poem Snarkjakten (The Hunting of the Snark, 1959), so a successful publication seemed likely. Hallqvist translated, Jansson drew, Lindgren published it, and it flopped! 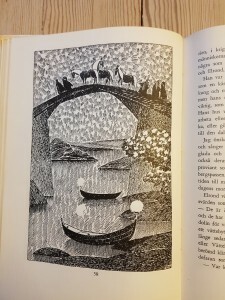 Tolkien fans didn’t enjoy Jansson’s drawings much, and the illustrations were not used** again before 1994. 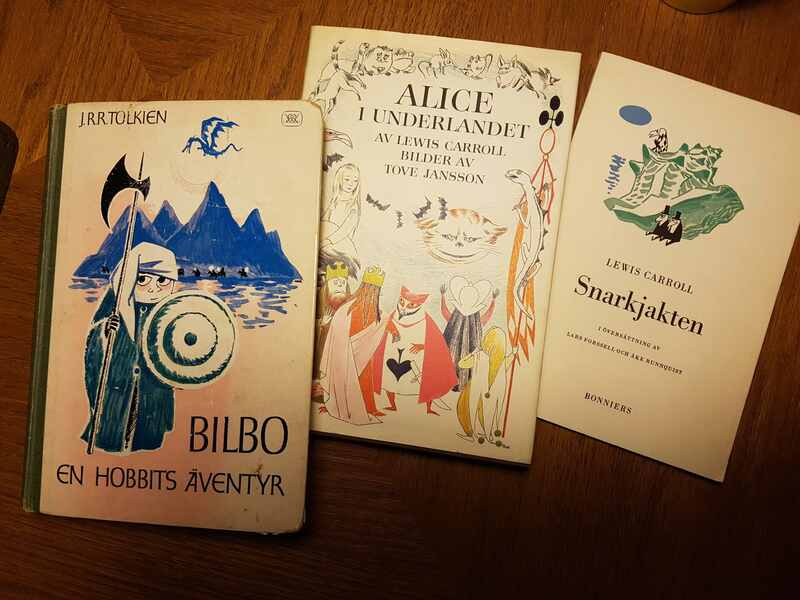 By then, the 1962 version was cherished by Tove Jansson fans and Tolkien collectors over the World, and it had become quite hard to find. The 1994 edition was sold out in a jiffy. The illustrations were finally “blessed” by the Tolkien Estate, when they were used for the 2016 Tolkien Calendar. 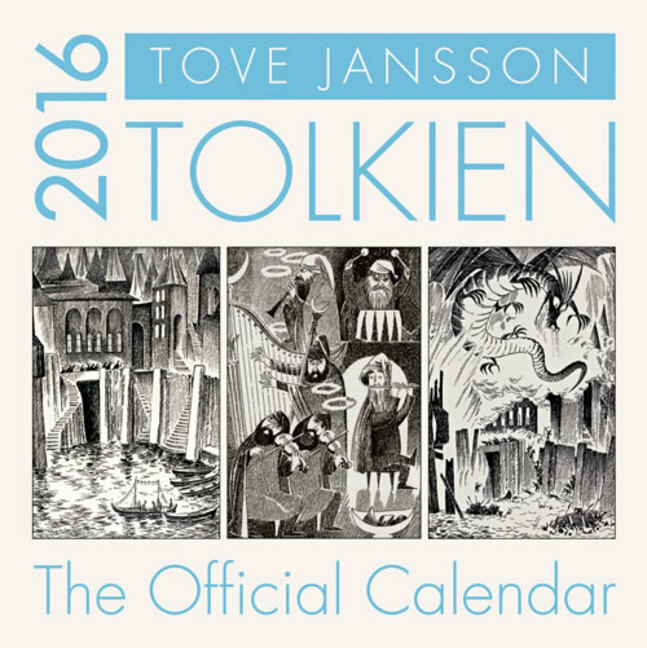 Jansson’s illustrations were also used in the 2016 Tolkien calendar, which I’m, afraid to say, have not acquired (yet). I was lucky and found a decent copy of the 1962 edition in a Japanese(!) bookstore on the Net. Now I LOVE this book. Its illustrations are absolutely gorgeous. This book makes a great additon to my ever growing list of Hobbits. It would be a pity to let this book stay alone without decent Janssonic company, so I searched a few weeks, was lucky again and found a nice copy of the mentioned Snarkjakten by Lewis Carrol, and an almost mint copy of the absolutely fantastic (in all meanings of that word) Swedish 1966 edition of Alice i underlandet (Alice in Wonderland). If you enjoy Alice, you will love Janssons’ illustrations, even outshining her work on The Hobbit. 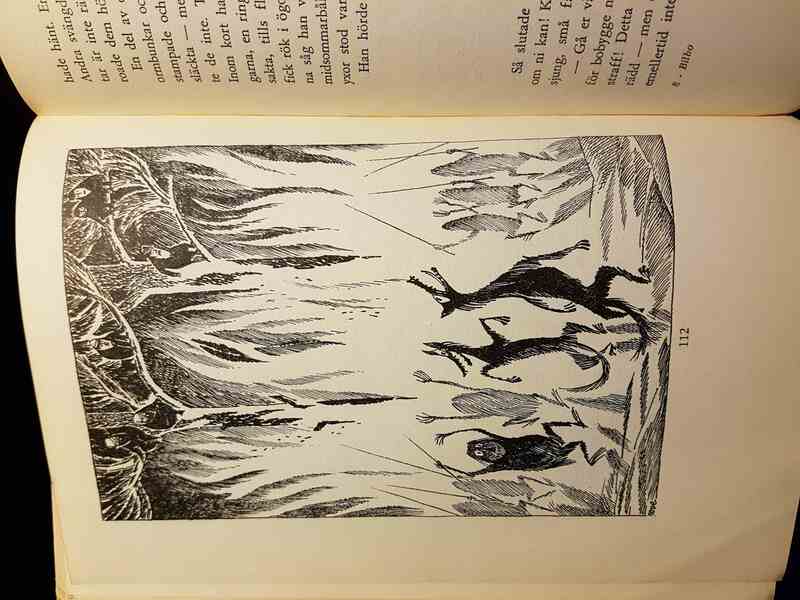 Janssons illustrations of Alice were later used in a lot of versions, among them, Finnish, American, British, and Norwegian editions. For an intensely interesting read about Jansson’s artistic work on these classics: Read Olga Holownia’s essay at barnboken.net. That’s it. Merry Christmas and happy Youletide everybody! 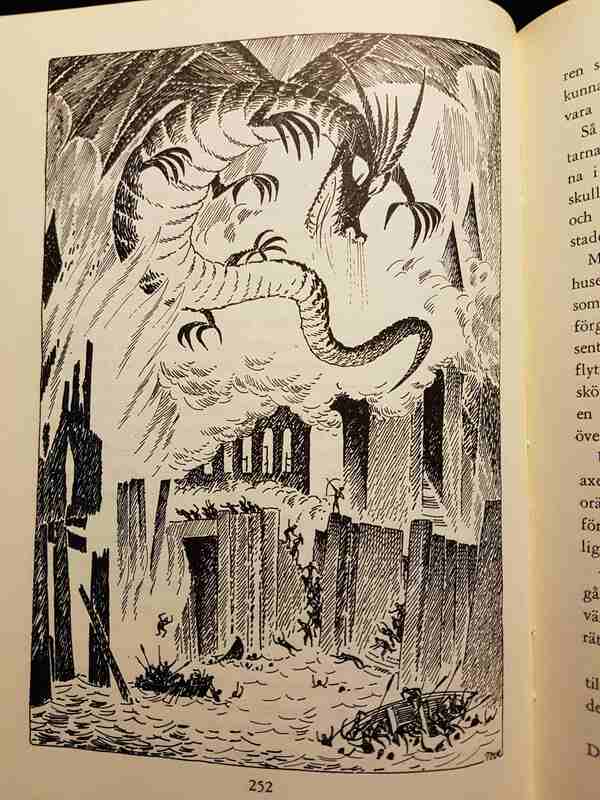 **) Actually, there were other versions with Jansson’s illustrations; the Finnish Hobbit Lohikäärme-vouri (The Dragon mountain) from 1973, and the updated Finnish translation in 2003. 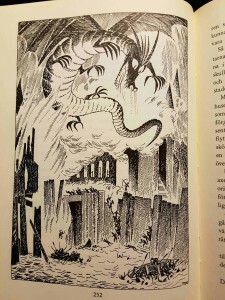 The illustrations were also used in this year’s Finnish 80th Anniversary edition of The Hobbit. While Varnish is most famous for its speedy caching capabilities, it is also a general swiss army knife of web serving. In the spirit of Christmas, here’s Twelve Days of Varnish Cache, or at least, twelve Varnish use cases. Read the rest of this post on Redpill Linpro’s Sysadvent calendar. While dynamic DNS is a wonderful tool for automation and orchestration, tools for easy cleaning up and logging changes are needed. This post describes a couple of scripts that may help. Read the rest of this post on Redpill Linpro SysAdvent Calendar. Eemeli får i oppdrag å bygge kirke til minne om sin bestefar, en angrende kirkebrenner. Han får i hop Dødskirkestiftelsen, finner en tomt innpå skogen, og går i gang med å bygge kirke. Det blir en vakker kirke, og etter mye krangling med leke og lærde myndigheter, får de til slutt både innvielse, byggetillatelse og prest. Rundt den vakre kirka vokser det opp et lite samfunn som klarer seg selv, og det kommer godt med når verden utenfor går fullstendig av hengslene med verdenskrig og sammenbrudd. Dødskirkestiftelsens samfunn er selvforsynte med oksekraft og ved, elgkjøtt, lagesild og poteter, badstue og dram, så de overlever. Et lite alvorsord om bærekraft og miljø fra Paasilinna, blandet med en hel masse sprudlende humor og myndighetsforakt. Bare titlene som figurene bærer med stolthet, er i klasse for seg. “Forhenværende togvaskerforkvinne Taina Korolainen” er f.eks en viktig person i fortellingen. Paasilinna anbefales jo stort sett alltid. Denne boka er ikke noe unntak. Perlefiskeren Kino og Juana er fattige, men lykkelige. De har et barn, Coyotito. Coyotito blir stukket av en skorpion. Juana suger ut giften, men er redd barnet skal dø av stikket. Den lokale hvite legen vil ikke hjelpe dem. Samme dag finner Kino en stor perle. En perle så stor at han antar han vil bli rik, kan hjelpe Coyotito, og skape seg en fremtid for ham og familien. Men med perlen kommer grådighet og vold. Denne klassikeren er visstnok en gjendiktning av en gammel mexicansk fortelling. Den korte triste teksten kan gjerne brukes som en liknelse som forteller om menneskenes ondskap, egoisme og grådighet, men forteller også om å stå opp mot nettopp dette. Har du ikke lest Perlen er du en udannet grobian. Les den med en gang. Vi er tilbake i Chrestomanci sin “egen” verden, kronologisk noen år etter den første boka i serien. Eric (eller bare “Cat”) har blitt noen år eldre, og hakket mer selvstendig enn sist. I en landsby i nærheten av Chrestomansi Castle har en gammel familiefeide blusset opp igjen. Pinhoe-slekta har samarbeidet bra med Farleigh-slekta, men Marianne Pinhoe, jevngammel med Cat, mistenker at Bestemor Pinhoe kaster magi og forbannelser på tvers mellom familiene, da hun og senga hennes blir flyttet fra det gamle huset, til et sted der familien kan ta bedre vare på henne. Marianne Pinhoe blir kjent med Cat, og sammen finner de en magisk hemmelighet i det gamle huset. Ved siden av hovedsporet i fortellingen er det mange morsomme sidespor. Mariannes bror og Chrestomancis sønn Roger er to luringer som har smarte prosjekter på gang. Cat lærer å ri. Flyttingen av Bestemor Pinhoe er litt av et sirkus. Chrestomancis datter Julia, og hennes venninne Janet, som er Cats søster Gwendolen sin ekvivalent fra en annen verden (ja, det er komplisert med parallelle verdener) har kjærlighetssorger som tenåringer flest. Lunt og morsomt. Fin ungdomsfantasy i serien.